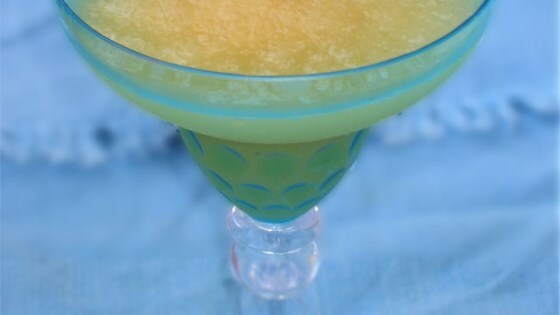 "This is a great frozen summer drink that is very thirst quenching! Vodka may be used instead of gin." Put 7 cups water in large saucepan, and heat on high until boiling. Add sugar and stir until dissolved; set aside to cool. Place tea bags in 2 cups boiling water, and let steep until desired strength is acquired. In a large bowl, mix together sugar water, tea, lemonade concentrate and orange juice concentrate. Stir in gin. Place in freezer container and freeze overnight. To serve, Place several scoops into a tall glass, and fill with any clear carbonated beverage. This was great! Made it for a dinner party - everyone loved it. I used Bacardi Limon Rum instead of Gin or Vodka. Some people didn't know it had alcohol in it so beware and warn your guests! This is a great alternative to the "usual". We've had this recipe in our family for years - but with Amaretto instead of gin. Try it! You'll love it! totally awsome! This is now our summer drink. I made it virgin and froze it and added what ever liquour guests wanted. also added sliced limes, oranges and cherries. Thanks for a great recipe! I used Arizona Sweet tea instead of making my own tea, and used vodka instead of gin. it was the favorite at my BBQ this summer. Cant wait till next summer to make it again. We've made this recipe for years with 2 1/2 cups of rum, mixing it with Sprite to form a thick slush. Great for hot summer days! YUM!!! I kept a big bowl of this in my freezer the entire last month of summer.